He took up residence in my room. He’s pretty quiet, and not as hungry as I might have expected. He keeps me warm, and pretty fashionable. Best find ever. $25 from the Thunderbird gift shop in Banff. Banff and Canmore are stuffed with restaurants that are Canadian influenced, featuring many regionally sourced ingredients. I’m not sure if this is a boom of sorts, as I do not recall this trend of awesome restaurants on previous trips, but maybe I just didn’t have the interest (or bank account…) at the time. Either way, if you haven’t been to the Albertan Rockies in some time, there are many new restaurants to check out. After much consideration, Mike and I finally decided to eat at The Bison. There are so many great sounding restaurants, it was hard to decide. What really sucked me in were the miniature lamb corn dogs and lavender S’more on the menu, and the promise of smoked meats and housemade condiments. The Bison is a casual two floor restaurant, with a deli and shopfront on the first floor, and a patio, bar and restaurant up top. The deli sells sandwiches, as well as their condiments. It is very casual (is any place in Banff or Canmore truly fancy?) but the prices are a bit high. So, pretty standard for Banff. We were quickly seated and started with beer and bread. They have Okanagan Spring beer on tap, and the bread (from the bakery next door, served in a rustic tree bark bowl) came with softened fleur de sel topped butter. Naturally, I had to get the lamb corn dogs (adorable, but delicious as well) and a main of wild mushroom tagliatelle with leek and plump fresh peas, under an avalanche of goat cheese. It was super creamy, and my only small issue was that there may have not been enough noodles to support the sauce. Lamb corndogs came with house made mayo and grainy mustard. I could have eaten an entire serving platter of these. Mike got the daily soup (squash with smoked bacon and peaches) and the venison feature plate. The Bison does game meat like I have not had it before, and I have sampled widely from Alberta’s large mammals, such as calf moose and deer, hunted by my mate. Wild is pretty different from ranched. So, if you live in Alberta, you know we’re in a full blown Indian summer, with very hot days, which is unusual. The day we chose to go up and through Cory Pass, it was over 30 degrees Celsius. Insane for September, but I’m so happy about it. It provided two weeks of outdoor opportunity, extended my summer which was very busy otherwise. Cory Pass trail is a real challenge, and it was not easy getting up and over. But, I feel really accomplished, and happy that my summer included some hiking. I hope to do more next year. Up early on Wednesday. Too early; the sky was still mauve and pink like it gets on early mornings in the mountains. Mike, Connor and Madlen cruise up the mountain. I was dying back behind! I kept making excuses about “taking photos.” Somewhat comically, because of the bright and harsh sun, I did not take many photos. Connor and his huge sausage. No, seriously. We got him a kilo of Hungarian sausage from a new favourite deli in Edmonton: Budapest Deli. They also sell at the downtown City Center farmer’s market on Saturdays. We stopped and had a light lunch at midday in the middle of the pass. I was feeling nauseous from the heat, so I didn’t eat much. Through the pass! Looking back: we came through the middle part. Mount Louis is looming above. Maybe one day I’ll return to rock climb it. We saw some neat things this trip, a white-tailed deer, pika, a lynx hunting beside the highway, and a half eaten rabbit. It’s head and forelegs were gone! Okay, that was wasn’t really neat. Mostly creepy. Read more about Cory Pass. Suckers for punishment, Mike and I again headed to the mountains to hike last week. This time, one of the more challenging hikes in the area: Cory Pass, and with two friends, Connor and Madlen (they live in Lake Louise). Add to that some amazing (but brutal) hot weather, and it was a tiring but exhilarating day. From start to finish, through the 6 hour, 14 km hike with 980m of elevation all we were talking about were beers at The Grizzly Paw at the end of the day. Okay, we talked about sausages too. Don’t judge us! We made our way over, and immediately ordered beers, which are brewed on the property. It’s the only brewery in the Rockies, I believe. I got the eight-glass sampler tray, and ordered a few full-sized favourites later. Even if you have gotten the sampler before, it’s fun to drink and features seasonal brews. Highly recommended. You work your way from light to dark, ending with the really hoppy Indian Pale Ale in the centre. I think the 3 oz samples were of Powder Hound Pilsner, Grumpy Bear honey wheat, Beaver Tail raspberry, Big Head nut brown, Rutting Elk red, India pale ale (indra island), Moose Knuckle stout (made with locally roasted and ground coffee, Beamers) and one I can’t recall. The stout and raspberry were particularly good, and normally I wrinkle my nose at both. The tray was $12 or so. Collectively, I think we tried every beer on the menu, except for the Wit and Oak Aged Barley Wine. My Baja burger, with guacamole and salsa. Salsa was woefully under represented, but the mountain of fries soothed my anger. The burger was chunky, meaty, but could have been a tad bit juicier, if you ask me. The Paw features a wonderful patio with mountain views, microbrews and in house brewed sodas. There is also a wide range of pub food. It’s a relaxed place that’s pretty much Canmore in a nutshell. Great for post-skiing or hiking relaxation. Something you MUST get if you are adventurous (and have room) is the signature Moose Knuckle Stout float. I know, beer and ice cream, what the hell? Trust me, this is a great combination. Coffee flavoured hearty stout, with just enough carbonation to ignite the chocolate ice cream into foaming. It’s rich, decadent and just a little bit strange. Our server was really excited when we ordered it. She said not many people go for it. The Grizzly Paw also has an on-site store that sells merchandise, their beer and sodas as well as hot sauces from the restaurant. It’s a great place to stop on your trip through the Rockies. And so began our adventure. As I have mentioned before, Yoho is about six hours drive from Edmonton. It’s a beautiful park, and home to the famous Burgess Shale fossil deposit. There are glaciers, waterfalls, abundant wildlife and stunning mountain ranges. It was a great place to get back into hiking. Things were a bit chilly at night, but it only rained one day (a wonderful surprise!!) and there was no snow. We made our base camp at Yoho Lake campground, and did two day hikes. One to the valley where Emerald Lake sits, and the other along the Iceline trail. We had planned to do a trail called Whaleback as well, but a late start and my sore feet nixed that. Probably a good decision, actually. The Iceline is a challenging hike, but I found it incredibly rewarding. I got to see the Emerald glacier up close and personal, passed by many glacial lakes, waterfalls, gorgeous meadows and forest, and we covered many vertical feet. A ten hour day saw us hike 27 kilometres in total. A few days later, I still have some sore spots! Trailhead sign. It was 4 kilometres on an uphill trail to basecamp our first day. Setting up our little house. A Gray Jay as a dining companion. Checking out the map on a break. So cold at night! I wore gloves, long underwear, pants, two tops and two jackets as well as a toque to sleep. Magically sunny and warm the next fair morn! So amazing to watch Yoho Lake steam in the morning. A moose came by for a very quick dip, but then took off. I was SO excited! Just getting above the tree line. Below the the Emerald Glacier on the President’s range. I was SO in love with this area. Geology come to life! There were striations of the receding glacier on the limestone rocks, and running glacier fresh water all over. Across the valley, you can see the Daly Glacier as well, feeding Takakkaw Falls. Trail mix for a snack. The sun setting over the valley. From the parking lot below. We were just below that top peak in the back! The most satisfying moment of finishing a hike: taking your boots and pack off. You can read more about the Yoho Iceline loop here. While Mike has gone hiking several times this summer and been able to spend quite a bit of time in the mountains, I have not spent time (save for road trip pee breaks) in the mountains for nearly three years! I really enjoy hiking and back country camping, but a mix of needing new hiking boots, working weird hours and finishing school really disabled me from hiking much the past few years. That all changed last week, I’m glad to say. Mike and I went on a two night back country hiking trip in Yoho National Park, near Field, B.C. We left early Wednesday morning, and drove about six hours in total to arrive in Field. On the way there, we stopped at Valbella Gourmet Foods in Canmore. Valbella meats are something I have longed to have access to for a long time. Many stores in Calgary sell their products, but in Edmonton, only Sunterra does. Some downtown, but more at the southside location. Here is a list of all their retail partners. Valbella does smoked meats well, with a specific interest in game meats and European style dried meats and sausages. We got some landjaeger and pepperoni on the way in, and on the way out, stopped for a snack of pâté. There are also pre-made sandwiches, deli meats and other snacks available. Valbella is the perfect spot to stop before your Canmore or Banff area dayhike! Cooler of sausages, bacon and dried meats. One of our afternoon snacks. The landjaeger on the left. It’s popular with hikers and other outdoors enthusiasts as it does not require refrigeration. It’s got a hearty texture, and is protein rich. Both sausages were great picks. We ate them with aged cheddar and crackers. Crackers and the gourmet variety of pâté. Valbella has some picnic tables near to their store which we ate under. You can smell the smokehouse, and see the mountains. Great combo! On the way home, we also stopped at the legendary Donut Mill on Gasoline Alley in Red Deer. You can’t miss it; it’s the huge windmill next to the huge teapot. For years I wrongly thought this might be a cheesily themed low rent diner with sad donuts. So wrong! Sour cream glazed, foreground. Background, Venetian Cream and Vanilla Lemon, both filled donuts. The Donut Mill makes dozens of interesting filled and classic donuts, all fresh. Sadly, many of their most popular selections are often out of stock. It’s a busy place, popular with tour buses and families. A dozen runs $7.50, and a half dozen $5.50. They have special deals on 5 dozen or more. There are also delicious sandwiches and soups, stews and chilis. Mon – Fri 8am – 6pm, Sat 9am – 5pm. Closed Sundays. Mike and I just returned from a long hike (more on that later) and I have been incredibly ravenous since we returned. I was particularly craving Indian food, as two reporters were walking around the newsroom with leftovers from Karma Bistro at work today. YUM. Acting on a tip, we checked out Zaika Indian Bistro. I’ll admit I didn’t have high hopes. The restaurant had several things going against it in my eyes. We pulled up after finding the restaurant fairly easily (first surprise.) The best way to get there is to head south on 91 Street from 23 Avenue. It’s located in a new strip mall to the west of 91st, just past Henday. You can also find it by going south on Parsons Road from South Edmonton Common, past Wal*Mart. The restaurant is to the east. If you hit Ellerslie, you’ve gone too far. Here’s a map showing the approximate location. Trust me, it is not in a field. The outside and restaurant itself was fairly sleek. It reminds me of an Indian themed OPM or Kai; even a junior Earl’s or Cactus Club Cafe. There is ethnic electronic music, dark interiors, shiny light fixtures and a stylish bar and large booths. However, I am happy to admit the restaurant is not all style with no substance. Although they have a huge, well stocked and fresh looking buffet in a beautiful set up ($17, available every night of the week), we ordered from the menu. To start, chatt pa pri (papadum with tamarind, yogurt and chick peas) and, surprisingly, wings. The chatt pa pri ($7) was a dissapointing start. The tamarind sauce was cold, and may have come from a bottle. The papadums were not freshly fried. This dish was just okay, and I was seriously concerned about the rest of our meal. The wings ($9) were a huge improvement, however. They were were spicy, but fruity. The chicken drumsticks were meaty, hot, not too fatty and came with a much needed (for my mouth, anyways) cooling raita dipping sauce and pickled carrots. A nice change from regular hot sauce wings. For mains, lamb korma and bhindi masala. The serving size of one main entree was sufficient for two. If you are very hungry, I would say get two mains, or order heavily off the appetizers to supplement, especially if you like leftovers. The lamb korma ($15) was good – tender meat coated in a lake of rich creamy sauce. The best was the bhindi masala ($13) though. It is okra, stir fried with tomatoes and onions and spices. Mike has become a real whiz at making this dish, and it is one I frequently request he make as it is a personal favourite, so naturally I had to try Zaika’s. Their bhindi masala was excellent, and I couldn’t stop popping the almost carmelized spicy okra morsels in my mouth. All main dishes ($11-17) at Zaika come with a well sized portion of basmati rice and a piece of fluffy fresh naan, which was a pleasant surprise. Service was good, if a little inexperienced at times. But hey, it’s a new restaurant. This buffet ($17) has got to be one of the most stylish in town, and the easiest to access. Circles! Why has no one done this before?! So while Zaika does not offer anything too new or surprising, it does turn out a good meal at above average value, in a pretty setting. There are some funky additions to the menu (like the “naan bar” appetizer) and of course, vegetarian options, but nothing too wild. I also did not see the word “fusion” anywhere. Whew! The server told us the restaurant has roots in another Indian establishment in town, Indian Garden. I think this really shows in their menu, and cooking. We were also told that all their produce comes from the new Asian market next door. Unfortunately, it had just closed when we left Zaika at 9pm, but I will return. I love a restaurant that supports neighbours! It will not surprise me if they become a very popular southside restaurant, even given their close proximity to the chain restaurant hellhole that is South Edmonton Common. A pox on thee, S.E.C! bonus: nearby, a cafe called Dumplings Plus is in the works, as well as “Real Deal Meats”. I’m ashamed to admit I had no idea this area was bubbling over with possibilities! update, October 16 2009: The buffet is excellent value. The items change daily, and are all fresh. Naan is freshly made and brought to your table, and there are light, crispy freshly made pappadums. Highly recommended. You can read a bit more about a recent visit here. A few weeks ago here at home, I had to wage war on fruit flies. Mike and I had been collecting some compost items in a bucket on our patio. 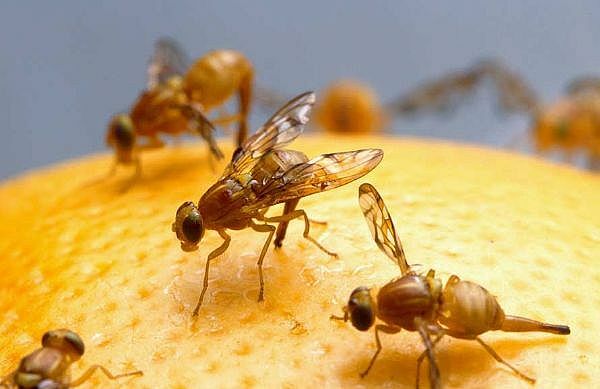 Some hot weather and holes in the patio screen ended in a killer infestation of fruit flies inside the house. In fact, it was damn near embarrassing, and if this story did not have a happy ending I doubt I would be telling you about it now. It was horrible. The flies were EVERYWHERE. The garbage in our condo and on the patio. They would swarm up when you walked past them congregating around the water cooler/sink drains. I immediately removed all traces of garbage. Ripe fruit went in the fridge, I bleached the counter tops and engaged in open warfare. I knew getting rid of the garbage would help, but would not curb the breeding. Simple. I trapped the buggers. Although I am not against using pesticides (I know, I know, but years of living in tropical countries really made me believer in the power of roach sprays) I could not use them for fear of killing my pet tarantulas and scorpions. So I used a natural combination. A shallow bowl filled with: a cup of warm water, splash of dish washing liquid and a quarter cup of cider vinegar. Cover with plastic wrap, pulled taut. Poke holes in the plastic with a fork tine, place. I made several traps, scattered near water in the kitchen and bathroom. The next morning, the infestation was slowed, and I was happy. Another day later, the flies were gone, save for their corpses which were black dots at the bottom of bowls. I felt like a champion. Kind of had to resist checking out the genetic characteristics of the preserved flies though. Old habits die harder than fruit flies, I guess.